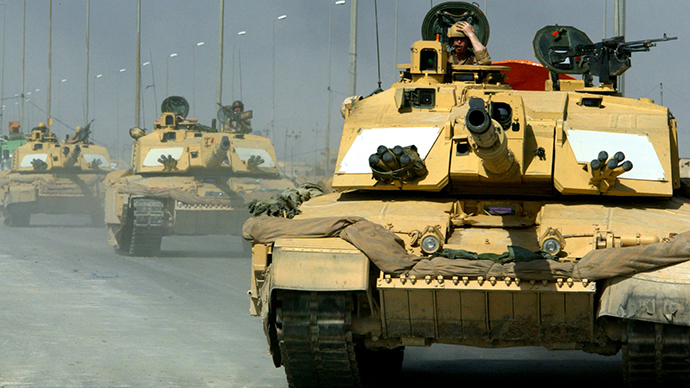 Raising the speed limit for tanks, troop carriers and self-propelled guns to 40mph (64kph) will cut traffic jams, improve safety and better prepare troops for armored warfare, according to UK defense chiefs. The limit for vehicles classified as “armor” was lowered to 20mph (32kph) 18 months ago, affecting tanks, armored personnel carriers and self-propelled guns. The decision followed the realization that defense chiefs had mistakenly assumed military vehicles were exempt from legislation in the 1970s intended to cover plant equipment such as tracked diggers. When the mistake was discovered in 2013, armored vehicle crews were made to adhere to the lowered limit. It appears ministers responsible for the decision are attempting to backtrack. While large-scale armored warfare was widely seen as being defunct given the nature of recent low-intensity wars in Afghanistan and Iraq, one prominent Tory last week aired his views during a much-hyped but sparsely attended debate on defense austerity. Rory Stewart MP, who is chair of the influential parliamentary defense select committee, said when considering the resurgent threat of a state-on-state conflict – particularly with Russia – current thinking on the utility of armored force should be reconsidered. “If we are going to think about maneuver warfare we have to think about armored warfare,” he said. The report also said the speed limit diminished road safety: “Armored vehicles travelling at 20 mph on public roads can cause long queues of traffic to build up behind them, increasing journey times for all road users. It was also suggested that when armored vehicles operate at low speeds, between normal gear ranges, stress resulting from the unusual frequency of the vibrations can harm crews, causing joint aches and pins and needles, as well as damaging engines.